2012 Year-End Roundtable with Joe McCulloch, Bill Kartalopoulos and Tom Spurgeon. 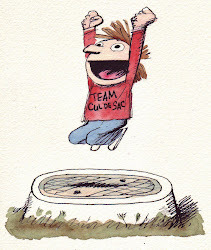 The discussion begins about Team Cul de Sac begins at 1 hour 31 minutes, and Spurgeon picks one illustration by Chris Schweizer to focus on. He also focuses on the possibility of self-promotion (ie being in a book with Richard Thompson), but when we were putting it together, it was more of a jam (albeit one-sided). Cartoonist helps kids learn history by creating comics [Dave McDonald].